PANGKALAN BUN, Indonesia -- Divers and an unmanned underwater vehicle spotted the tail of the missing AirAsia plane in the Java Sea on Wednesday, the first confirmed sighting of any major wreckage, 11 days after Flight 8501 disappeared with 162 people on board, an official said. Powerful currents and murky water continue to hinder the operation, but searchers managed to get a photograph of the debris after it was detected by an Indonesian survey ship, National Search and Rescue chief Henry Bambang Soelistyo told reporters. 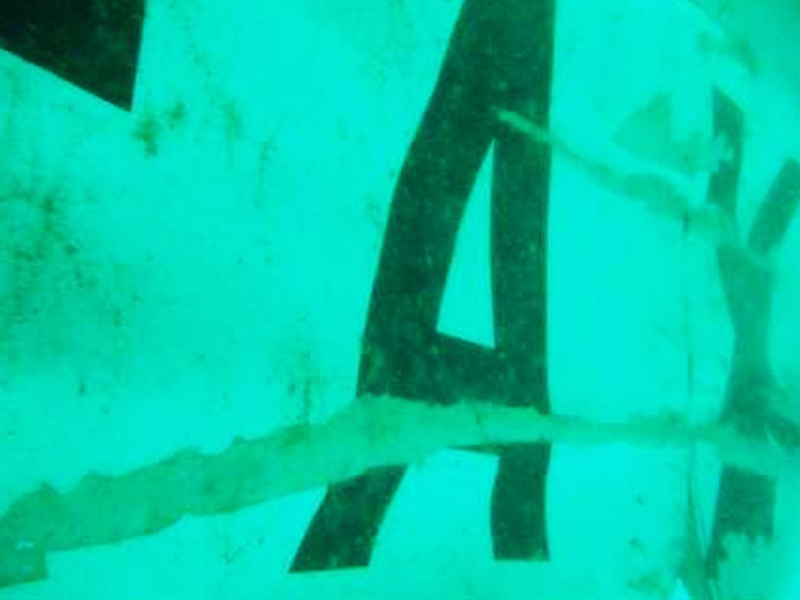 One released image appears to show an upside down "A'' painted on a piece of metal. The find is particularly important because the all-important cockpit voice and flight data recorders, or "black boxes," should be located in the aircraft's tail. Smaller pieces of the plane, such as seats and an emergency door, had previously been collected from the surface. "Today we successfully discovered the part of the plane that became the main aim since yesterday," Soelistyo said. "I can ensure that this is part of the tail with the AirAsia mark on it." He said a total of 12 objects had been located on the seafloor as of Wednesday evening. In addition to the confirmed tail section, divers were able to confirm that the 12 piece of debris located was from the aircraft. "Divers are now on their way to another spot which is not far from where the tail was found," he said at a news conference. "They are scouring the area and we hope to find the rest of the aircraft within this perimeter." The Reuters news agency quotes AirAsia boss Tony Fernandes as saying, "If right part of tail section, then the black box should be there ... We need to find all parts soon so we can find all our guests to ease the pain of our families. That still is our priority." Soelistyo also stressed that the top priority remains recovering more bodies along with the black boxes. So far, 40 corpses have been found, including an additional one announced Wednesday, but time is running out. At two weeks, most corpses will sink, said Anton Castilani, head of the country's disaster identification victim unit, and there are already signs of serious decomposition. Officials are hopeful many of the more than 120 bodies still unaccounted for will be found entombed in the fuselage. The Airbus A320 went down Dec. 28, halfway through a two-hour flight between Indonesia's second-largest city of Indonesia and Singapore, killing everyone on board. It is not clear what caused the crash, but bad weather is believed to be a contributing factor. Just before losing contact, the pilot told air traffic control he was approaching threatening clouds, but was denied permission to climb to a higher altitude because of heavy air traffic. No distress signal was issued. Government officials say satellite images indicate temperatures in the clouds were about 121 degrees below zero. A report from Indonesia's meteorological agency said "the most probable weather phenomenon was icing that can cause engine damage due to the cooling air. This is just one of the possibilities that occur based on the analysis of meteorological data." Aviation analyst Kyle Bailey says the region sees "the worst thunderstorms in the world... you have lightning, you have updrafts, you have downdrafts, you have hail you have ice." Finding the black boxes will be key to the investigation. They provide essential information, including the plane's vertical and horizontal speeds, along with engine temperature and final conversations between the captain and co-pilot. The ping-emitting beacons still have about 20 days before their batteries go dead, but high surf had prevented the deployment of ships that drag "ping" locators. Sonar-equipped ships involved in the massive international hunt have also identified what they believe to be the fuselage of the plane. Several other big chunks have been found, though no visual confirmation has been received yet. AirAsia Flight 8501: How close are we to answers? The search area for bodies and debris was expanded this week to allow for the strong currents that have been pushing debris around, said Indonesian search and rescue operation coordinator Tatang Zainudin. In addition to heavy rain and wind, the monsoon weather has turned the Java Sea into a slush bowl. But in some ways, it is one of the best places to look for a missing plane, especially when compared to the extreme depths of the Indian Ocean, where searchers continue to hunt for Malaysia Airlines Flight 370, which disappeared last March with 239 people aboard. The water at the Indonesia site is shallow, but this is the worst time of the year for a recovery operation to take place due to seasonal rains that have created choppy seas and blinding mud and silt from river runoff. "Because the Java Sea is such an enclosed basin, and there's not really big currents passing through it, everything just stays there for quite a while and the waves make it so that the sediment doesn't slowly just sink to the bottom," said Erik van Sebille, an oceanographer at the University of New South Wales in Sydney, Australia. "It continuously keeps churning it up." He said the conditions also make it particularly dangerous for divers because the water is dark and murky, making it easy for them to cut themselves on jagged wreckage or even become snared and trapped. During the dry season, he added, it would likely be easy to see the plane underwater from the sky.